(b) Science Practical Exam - 23 Apr (Tue), 07:30-08:00 Auditorium. Please find S4 Assessment Schedule for your reference. Please find amended schedule: 2019 S4 Common Test Schedule - ver 2 for your reference. Amendments are in blue text. Do familiarise yourselves with the Exam Rules and Regulations. Please share the Common Test Schedule with your parents/guardian. Please note that the HPV vaccination for all Sec 1 female students (whose parents have given consent) will be conducted on 11 April 2019, Thursday. Please refer to the schedule below and report punctually for the vaccination in your S&W attire. Thank you. Please note that there has been some changes to the class schedule for the Health Screening. Please check back on the schedule posted in the original message which has now been updated, or you may click HERE. The Annual School-Based Health Screening for our students will be conducted from 8 April 2019, Mon to 17 Apr 2019, Wed. Please refer to the letter from the Health Promotion Board HERE. Time: During curriculum time. Please click HERE to view the class schedule. (1) For both Secondary 1 and 2 students - please come in PE attire. For new foreign students, please bring your Health Booklet and Immunization Certificates. HPV vaccination for Sec 1 female students (whose parents have given consent) will be conducted on 11 April 2019, Thursday. (2) For Secondary 3 and 4 students - you may either come in PE attire or school uniform. (3) Only selected students from Secondary 3 and 4 will be screened. Students selected for the Health Screening will be informed separately. (5) Absentees will have to do their Health Screening on 17 April 2019, Wednesday. HPB has provided a vision screening chart to the School (sponsored by Essilor Singapore). As vision screening by the HPB team will only be conducted for Sec 2 students, students from Sec 1, 3 and 4 can use it to check their own visual acuity if they suspect worsening of vision. The Vision Screening Chart and the instructions for use have been put up outside the ICT Helpdesk. For students supported on 100% Independent School Bursary (ISB) and who may require spectacles based on the vision screening results, a $50 voucher for spectacles frame and a voucher for free lenses will be issued. These vouchers are redeemable at participating optical shops and a list of these optical shops will be given to the students. Students (100% ISB only) who require spectacles will need to provide their Visual Acuity Reading in the Googleform (HERE) by 5 April 2019. For further clarification, please contact SST General Office at Tel: 6571 7200. Thank you. In conjunction with Earth Week in Term 2 Week 4, the Environment Education Committee is conducting a workshop on Marine Plastic Pollution. *This workshop is not for students who attended the Marine Plastics Pollution workshop at the St. John’s Island Marine Laboratory last term. 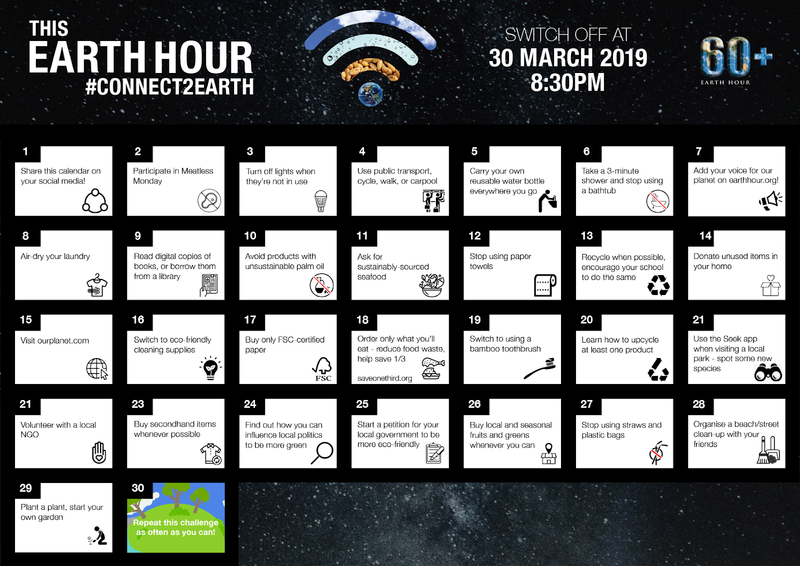 Earth Hour will be happening on the 30th of March 2019, Saturday. Starting as a symbolic lights out event in Sydney in 2007, Earth Hour is now the world's largest grassroots movement for the environment, inspiring millions of people to take action for our planet and nature. As accelerating climate change and staggering biodiversity loss threaten our planet, Earth Hour 2018-2020 endeavours to spark never-before-had conversations on the loss of nature and the urgent need to protect it. Join us in raising awareness on environmental issues by sharing about Earth Hour with your family and friends. You can also participate in Earth Hour by switching off the lights and other appliances from 8:30 pm to 9:30 pm on 30 March 2019. We have also shared with you a 30 day Challenge Calendar*. Try it out and see how far you can go for Mother Nature. The School Dental Service (SDS) will commence service to Secondary 1 and 3 students from 1 April 2019 (Monday) onwards. Students, whose parents have given consent earlier, will be required to report during school hours, upon request by the Dentist, to the mobile SDS bus which will be stationed at the visitors parking lots. Please note below the class schedule. Please understand that the schedule may be subject to changes depending on the situation each day, due to the nature of treatment. For more information, please contact the General Office at Tel: 6571 7200. Thank you. The 2019 Term 2 timetables (ver 1n) are now ready and you may access them HERE. Please take a look today and be ready for your lessons tomorrow. *Updated on 17 April 2019* Minor change in timetable; affected classes have been informed. New version 1n is now available via the same link. Please note that the Info Hub will be closed from 1pm on 15 March to 24 March 2019. The Info Hub will open on 25 March 2019 in Term 2. These are the Classroom Climate Survey briefing slides used at this morning's briefing. Please be at your classrooms for morning assembly this Thurs and Fri (14 & 15 March). You will be using your LDs (or mobile phones) to complete the surveys so please charge your devices. 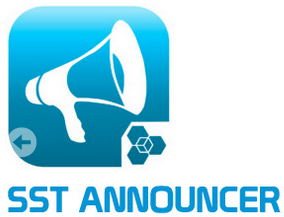 Do ensure you have access to your SST email accounts as the links to the survey forms will be emailed to you.